In the last post "Can't it be prevented? -Introduction to canyoning and its hazards-", I talked about some of the accidents happened in the last 2 years in Jordan canyons as an example of these accidents happening all around! Maybe most of these accidents I mentioned occurred with individual Travelers who are not supervised or not joining groups, but some happened with people who promote themselves as professional guides! I agree with a comment I received on that post, accidents is the word used to excuse the lack of professionalism, a professional is one trained to leave no chance for accidents. Even with the extreme nature of the canyon, a professional should be able to read the signs of the nature and be proactive to it, but in the same case he should be able to deal with any case to minimize its impact. In our case in Jordan, the biggest problem occurs due to random access to hazards area by none trained and none professional people. Many calls were made to have a control on accessing these places by sort of land owners or so. But without the existence of a set of standards there won't be a way to differentiate between the good and the bad. Canyoning as a sport is still new in many reasons in the world that can face a lack of understanding from legal bodies. The countries vary in their recognition for this sport, some have very fine organized laws organizing every aspect for this sport while some still straggling to find their way. I found the Australian canyoning code of conduct as a well developed model a good base to start our own modified code of practice. Why Do We Need a Code of Practice? -In the absence of any other guidelines or codes of practice, Government bodies may use the industrial Codes of Practice / Standards / guidelines to assess the roping techniques that we use in the recreational / educational world. Is this what our industry wants? - The Outdoors Community will finally have a document that details the standards required for roping activities. - Roping leaders from other areas and countries will be able to gain an understanding of how we operate. 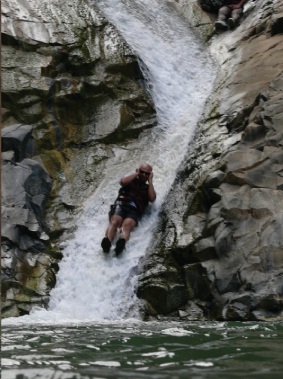 - Give a general background for all people who are interested in canyoning to be able to judge who safe their guide / tour operator is. - Find a good guide line for those who are welling to learn the techniques for canyoning. Through the last 7 years in which canyoning become more popular activity in Jordan, many attempts where made to find an organizing body for the outdoor activities in Jordan, badly these attempts are still not able to find an umbrella that covers all the people of interest. the reasons in most cases was the lack of understanding of this activities and its importance from the governmental bodies, and the high competitive market between the commercial canyoning trips operators. This lead to the fail of all the attempts that was maid to organize the situation for canyoning and Outdoors in Jordan. But i want to thank those who at least try their best to make it work. In the next post i will put the proposed Grading system for Jordan Canyons based on certain criteria. and a suggested Leader to Participant Ratios and Group Size plan for the canyons. Download WA Adventure Activity Standards, Canyoning Document from our Resources Section In Explore Jordan Website.